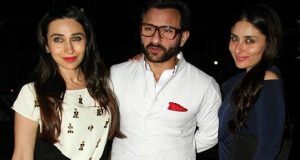 Mumbai (IANS): Actress Karisma Kapoor, who believes in moving with the times, considers her younger sister Kareena Kapoor Khan her role model. The glamorous sisters sat down for a tete-a-tete with each other for Kareena’s radio show, Ishq 104.8 FM’s ‘What Women Want with Kareena Kapoor Khan’. During the chat, Karisma spoke about staying relevant, how she manages to be radiant, her role model and the pressure of making a comeback in the industry, said a statement. The daughters of veteran actors Randhir Kapoor and Babita, Karisma and Kareena are six years apart. She credited her radiance to the genes. “And, I guess it’s the inner positivity which reflects on my face,” said Karisma, a mother of two. The actress, who has featured in films ‘Raja Hindustani’, ‘Raja Babu’, ‘Dil To Pagal Hai’, ‘Biwi No. 1’, ‘Zubeidaa’ and ‘Fiza’, has been missing from the big screen for a while. She finds it unfair that there’s a “comeback pressure” actresses face, especially after motherhood. “I don’t get this comeback term as it isn’t used or said in other industry when women have rejoined their workplace. The episode featuring Karisma will be aired on the radio on Wednesday.